This is a cool thing that is going to happen soon: I will be teaching an all-day class at Old Economy Village on knitting and spinning. What is the deal: We will meet from 10-4 on Saturday, November 10th, at Old Economy Village. About half the day will be spent learning basic spinning on a drop spindle, and half will be spent learning how to knit. You can come into the class with no skill at all in either art and leave with the basics to make your own scarf. The cost is 60$ for an all day class. That includes ALL materials: A drop spindle, spinning fiber, knitting needles, and yarn. * I didn’t set the price, but I can tell you, that is such a good deal that if you already know how to knit,** it’s worth it just for the spinning part (and you’ll get a nice ball of yarn, pair of needles, and a free pattern out of the deal). 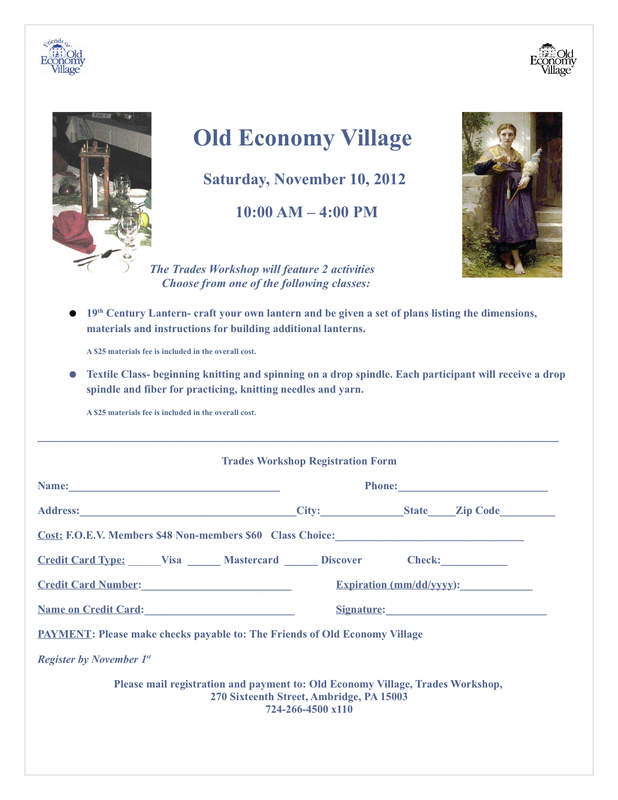 Click Here to download Trades Workshop Registration PDF. Please sign up by November 1st (That’s in less than 2 weeks! ACK) so I know how much to bring in the way of supplies. I’m so excited about this. I’ve taught beginning knitting more times than I can count, but I’ve never taught drop spindling to a big group before. The class I took to learn drop spindling was so well done and left me feeling so empowered to go spin by myself, and the skills were totally transferrable to a spinning wheel when I was ready for that step. I hope to be able to provide that clarity and confidence with this class. Plus it’s at Old Economy Village in Ambridge, which is just a beautiful place to be. *I will mostly bring wool yarn, but I’ll have a couple of non-wool options as well if you are allergic. If you are coming and you know you are definitely allergic to wool (and not just sensitive to scratchiness), please let me know. I will only have wool fibers for spinning, since it is very hard to learn on anything else, but I can direct you to more highly processed wool if you are sensitive. **If you already know how to knit, you can bring a more advanced project to work on; if you already know how to drop spindle, I’ll have a spinning wheel with me that you can play with. Just found out about this event (it’s late on Nov. 1). Can my 10 year old and I still register? She can crochet and started knitting. We just got a spinning wheel and need to learn the basics of spinning. YES still sign up! I expect we’ll keep registration open as long as we can, so by all means call old economy to check!